We are so excited for our first December! Our favourite part of the holidays is getting together with the ones we love over great food. We’ll be closed on Christmas Day so our staff can spend some quality time with their families, but we’re open for business as usual on Boxing Day with brunch until 2pm! Still haven’t quite figured out what to do for New Year’s Eve? Come down to Frankie’s for dinner and $3 glasses of prosecco before heading to the Inner Harbour for live music and fireworks! 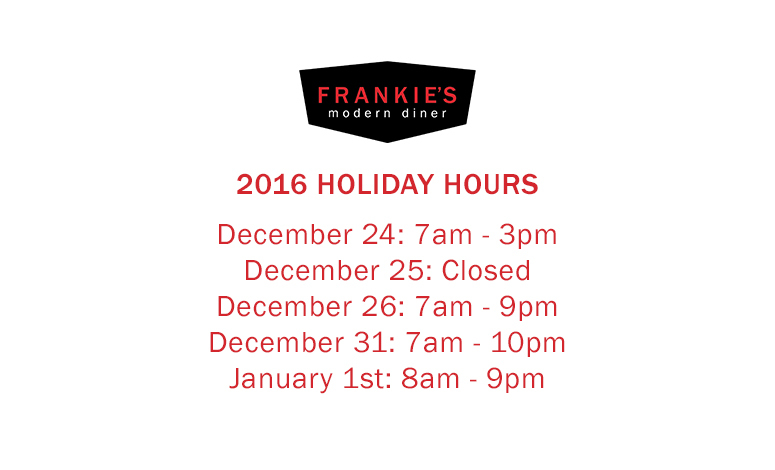 Give us a call at 778-265-8575 to reserve your table and toast the new year at Frankie’s.